Yes, you can bring your pet north of N. 10th St and south of S. 10th St. All dogs must be on a leash no longer than 8 feet and please remember to pick up after your pet to help keep our beaches beautiful. I would like to get married on the beach. What do I need to do? You can get married on the beach. Although Flagler Beach is public access, the City does have a permit process for weddings on the beach. Most of the weddings do not meet the requirements to have a permit issued, but some do. There are various items that would trigger a permit such as number of attendees, location, time of year (how busy the beach is), temporary structures, music, pyrotechnics, etc. Applicants should call the Clerk&apos;s office at 386-517-2000 to discuss the proposed event to determine if in fact it would require a permit. There are establishments within the City limits, such as Island Cottages by the Sea and the Golden Lion for a more casual affair. The staff at those locations can help plan your day. Can I bring alcohol on the beach? As an individual, you may bring alcohol on the beach. If you are having a large party, again this would fall under the special events permit. Can I build a bonfire on the beach? Yes, bonfires are allowed and must adhere to the following rules: Fires on the beach between May 1st and October 31st are prohibited. To have a fire on the beach, we require that you complete a burn permit request within 3 days of your desired fire and abide by the following: Complete a burn permit request form in person at the Flagler Beach Fire Department, located at 320 South Flagler Avenue. You will need your driver’s license with you at the time of the permit request. Notification of time, date, and location of the fire to the fire department prior to ignition. Ensuring there are no active burn bans within the city limits and/or county. Fire must be contained in a metal drum or similar container, as to not leave remains on the beach. A hole must be dug to the depth of the estimated flame height (i.e. 4ft flame = 4 ft hole). A means of extinguishment must be nearby. Examples of a means of extinguishment would be a bucket of water or a shovel. The fire must be supervised at all times and must be completely out before leaving. All wood containing nails and/or screws are prohibited. We encourage anyone with questions on having fires on the beach contact the fire department at 386-517-2010. One of our friendly firefighters will be more than happy to answer any and all questions you may have. What area(s) and times of the year are lifeguards on duty? On weekends October to May, and every day between Memorial Day and Labor Day. The lifeguards are on duty from 9-6. They are located from N 9th Street to S 9th Street. What do I do if I come across a turtle nest or stranded wildlife? All known nests on our beaches are marked with four stakes, survey ribbon and a sea turtle nest sign. However, even the most diligent sea turtle monitoring program misses nests. Keep away from sea turtle nests. Stay out of soft sand areas at the base of dunes. Do not disturb nest markers or barriers. Support dune conservation and restoration. Report unmarked turtle tracks to the turtle patrol. Contact the turtle patrol or beach patrol if you see someone disturbing a nest. If you come across a stranded turtle, you need to contact Turtle Patrol at 386-763-0977. If you find a bird, you need to call Trey Hatch, a representative at DEP at 877-314-1329. What are the rules for surf fishing? Please click the following link to see the basic recreational saltwater fishing regulations https://myfwc.com/fishing/saltwater/. I am in a wheelchair. Are there handicap accessible ramps and equipment that will allow me to enjoy the beach? 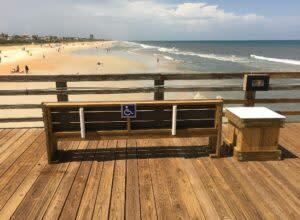 Yes, there is a handicap ramp located at the Pier and there is handicap accessibility at Gamble Rogers State Park. 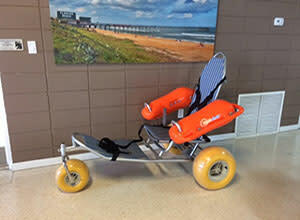 The City of Flagler Beach has acquired equipment to enrich the beach experience for residents and visitors with disabilities. 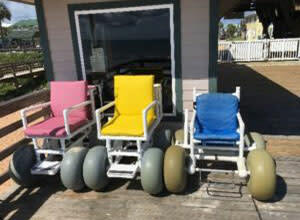 The equipment includes wheel chairs with extra-large tires for movement through sand, a semi-recliner chair for use in the water and wheelchair accessible benches on the iconic Flagler Beach Municipal Pier. All chairs are available to the public free of charge. Persons or parties that would like to utilize the mobi-chair of the beach access chairs should contact the on-duty Flagler Beach Pier & Bait Shop Attendant. A Driver&apos;s License or identification card will be required to reserve the specialty equipment and will be promptly returned when the equipment is returned. The daily hours of operation for the Flagler Beach Pier & Bait Shop are 6:00 a.m. - 12:00 a.m. (midnight) and their phone number is (386) 517-2436. What do I do if I get caught in a rip current? Don’t panic or swim against the current. Relax, float with the current until it dissipates and swim parallel to shore and back in. Raising your hand into the air will identify yourself as someone in need of help. Stay calm and wait for help to arrive. Of course, the best way to avoid a rip current is to know the surf conditions before entering the water. One or more of the following features indicate the presence of a rip current: darker color surf, indicating deeper water; murky, brown water caused by sand stirred up on the bottom; smaller, unorganized waves alongside more evenly breaking waves over a sand bar; waves breaking further out to sea on both sides of the rip current.